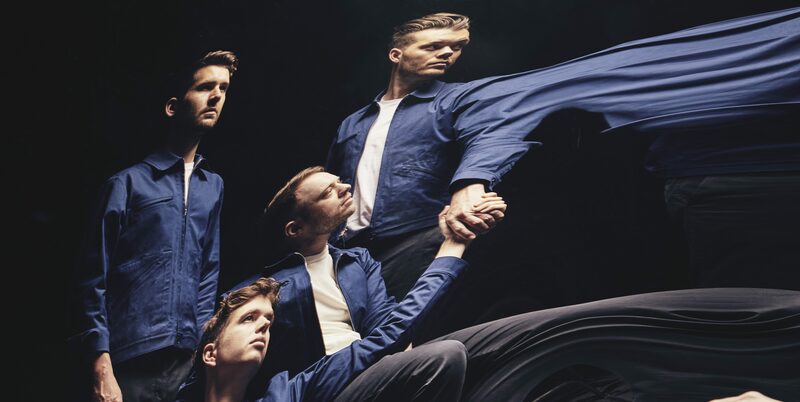 Everything Everything's latest four-track EP shows them to be, as ever, finely attuned to the untidy rhythms of modern society. Everything Everything are an experimental indie rock quartet that could be comfortably described as “Radiohead that you can dance to”. Last year’s A Fever Dream was an engrossing project, full to the brim with hypnotic synth-led tracks and the expected pop tunes with effortlessly-screamable lyrics. Now, this band-in-ascendance have released a surprise EP to mark the beginning of their latest tour. Entitled A Deeper Sea, it showcases more of what made A Fever Dream so compelling, and provides further evidence that Everything Everything are one of the most exciting acts in British music today. Listeners should be forewarned that this is a companion piece to A Fever Dream through and through, from cover art to production to themes. Long gone are the days of Get to Heaven, which seem aggressively cheery by comparison. The close ties between them are understandable, with the two original studio tracks on the EP being leftovers from the album sessions. If this is the strength of Everything Everything’s scraps, then the outlook for the band’s next full-length album is very optimistic indeed. Though Everything Everything are skilled melodists, the hook that keeps listeners returning to their albums is invariably the lyrics. Jonathan Higgs’ biting satires and commentaries, delivered in his unique falsetto, push Everything Everything from simply earworm fodder to progressive artists. The band challenge themselves on this EP by addressing a subject practically unexplored in modern pop – male mental health and the “current crisis”, as Higgs termed it, with male suicide rates. This is a bold but deeply-necessary move, which gives the opening track ‘The Mariana’ a tangible potency (“someone always has to be the man”, he sings). Its atmospheric trip through the eponymous deeper sea explores this theme, and extends A Fever Dream’s narratives of chaos and desensitisation. ‘Breadwinner’ is the stand-out track here, a sardonic statement on toxic masculinity and the breakdown of society, replete with Higgs’ rap-like vocal delivery. The imagery arrives thick and fast, with deft evocations of “hard liquor” and “mace”. In a first for Western music, the 1879 Zulu War and the 9/11 attacks are referenced in the same song; a jarring contrast, but it cannot be denied that it holds the attention. Michael Spearman’s pulsing drums help tie the song’s disparate sounds together into something undeniably catchy. The track would not sound too out of place on 2013’s Arc – a distant relative of ‘Cough Cough’, though unmistakably tinged with darker shades. Filling out the remaining two tracks is a Tom Vek remix of ‘Ivory Tower’ from A Fever Dream, and a cover of Neil Young’s ‘Don’t Let It Bring You Down’ performed live at the BBC. These are respectable offerings, with ‘Ivory Tower’ transforming into a punchy, robotic dance number but not compromising its message of political activism and division. However, only the die-hard Everything Everything fans will be craving much more after the stellar two openers. A Deeper Sea is another triumph for the band, who prove once again that lyrical potency need not restrict the pure musical aspect of modern music. Their unique rhythms, melodic lines, and surreal soundscapes are desperately needed today as indie pop threatens to become ever more formulaic elsewhere. Everything Everything also prove with this EP that, as is often the case, quality trumps quantity.